As a senior commercial litigation lawyer Stein Gudmundseth QC brings extensive experience to the table for every one of his clients. His career has been built upon always finding creative solutions to significant problems and commercial disputes, guided by his strategic planning and big picture thinking. He regularly puts this into action in court on civil, commercial and securities matters. Stein taught civil litigation at the University of British Columbia for 10 years, has been a speaker and contributor to the Continuing Legal Education Society and Insight. 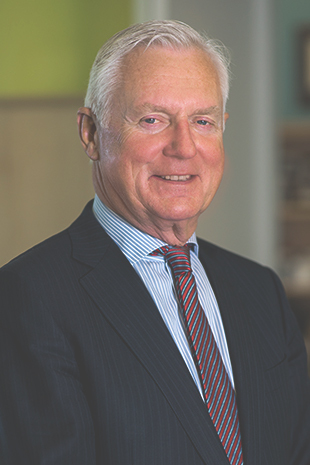 For 20 years, Stein served as the Honorary Consul General of Norway in British Columbia and in 2008 was appointed by His Majesty King Harald to Knight First Class in the Royal Norwegian Order of Merit. Stein was promoted to Commander in 2016. When he’s not finding solutions for his many longstanding clients he can be found skiing, running or on his boat. University of British Columbia LL.B. Counsel for Steve Nash’s holding company in a successful appeal overturning dismissal of a claim filed by Mr. Nash’s former counsel: B & L Holdings Inc. v. SNFW Fitness BC Ltd., 2018 BCCA 221. Acting for a defendant insurer in putative class action proceedings and obtaining summary dismissal of some of the claims: Lee v. Transamerica Life Canada, 2016 BCSC 191. Subsequently resisted the application to certify a class proceeding and obtained an order striking the entirety of the plaintiff’s claims: Lee v. Transamerica Life Canada, 2017 BCSC 843. Successfully defended proceedings claiming in excess of $5 million following the termination of a distributorship agreement: McIsaac v. Healthy Body Services Inc., 2009 BCSC 1716. Defended an investment dealer from a damages claim in excess of $10 million. A former investment executive had alleged the value of his book of business and earnings had suffered as a result of the investment dealer and its employees’ alleged unlawful conduct: Stenner v. ScotiaMcLeod, 2009 BCSC 1348; Stenner v. ScotiaMcLeod, 2009 BCSC 1093. Has acted for shareholders in derivative proceedings, corporate control and shareholder agreement disputes both in arbitration and in court. Has successfully obtained and resisted injunctive relief claims in relation to employment non-competition clauses. Successfully resisted an application to certify a class action proceeding and obtained an order striking the entirety of the plaintiffs’ claims: Lee v. Transamerica Life Canada, 2017 BCSC 843. Prosecuted claims against insurers, principally for loss of business, fire loss and theft, involving complex interpretation and valuation issues. Counsel for life insurer in many claims involving issues such as interpretation, misrepresentation and suicide. Acted for a life insurance company in successfully defending a $5 million death benefit claim: Community Credit Union Ltd. v. Transamerica Life Canada, 2009 ABQB 704. Resolution of investor claims relating to real estate and mortgage portfolios. Successfully appealed trial court decision finding competing former employees liable for loss of profits suffered by former employer: RBC Dominion Securities Inc. v. Merrill Lynch Canada Inc. et al, 2007 BCCA 22. Has acted for both employers and senior employee/executives in a variety of wrongful dismissal and breach of contract actions. Acting for the Government of British Columbia on the constitutional petition by the Provincial Court Judges’ Association challenging the Province’s decision on Provincial Judges compensation: Provincial Court Judges’ Association of British Columbia v. Attorney General of British Columbia, 2014 BCSC 336; Provincial Court Judges’ Association of British Columbia v. Attorney General of British Columbia, 2015 BCCA 136; Provincial Court Judges’ Association of British Columbia v. Attorney General of British Columbia, 2017 BCCA 63. Numerous representations before the B.C. Marketing Commission (National Products Marketing Act) and the Mediation and Arbitration Board now the Surface Rights Board. (Petroleum and Natural Gas Act; Mineral Tenure Act). Appellate court challenges of administrative tribunal awards. Representing and advising professionals in disciplinary matters. Successfully obtained and defended passing off injunction applications. Has been counsel in a large number of injunction applications involving commercial issues. Has long-standing experience in Mareva injunction (pre-judgment assets seizure) matters and in obtaining Anton Pillar orders. Has successfully challenged the BC court’s jurisdiction thereby permitting litigation to proceed in a foreign court where the client/defendant was resident: Aleong v. Aleong, 2013 BCSC 1428.